Dr Govinda KC on the 14th day of his fast-unto-death at Karnali Academy of Health Sciences in Jumla on Friday. 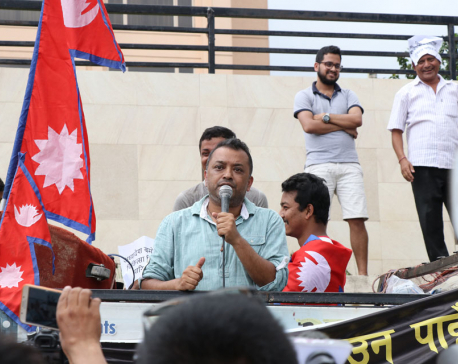 KATHMANDU, July 14: While Education Minister Giriraj Mani Pokharel has publicly announced that Dr Govinda KC will be forcefully airlifted from Jumla to Kathmandu to save his life, Dr KC and his supporters in Jumla are all set to foil the government’s plan until his demands are addressed. 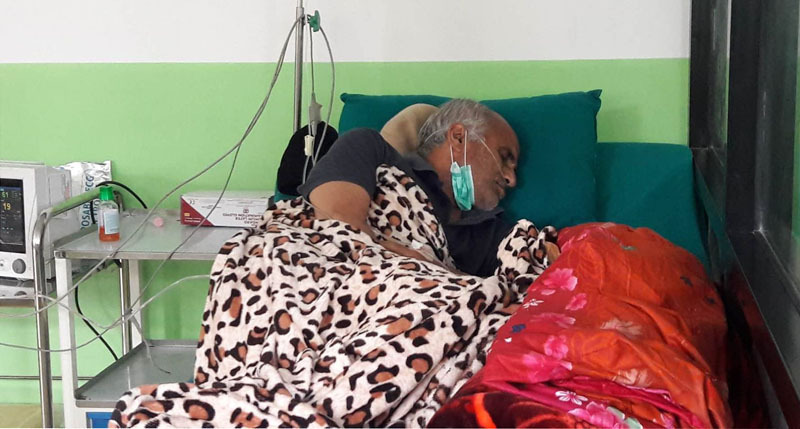 Dr KC, senior orthopedic surgeon and professor at the Institute of Medicine (IOM), began his 15th fast-unto-death from June 30 in Jumla, pressing a seven-point demand. 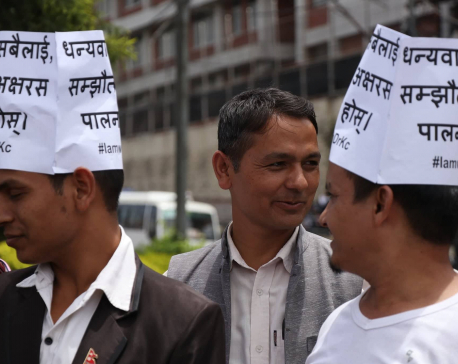 The demand includes bringing the Medical Education Act without changes, immediate publicizing of the report of the medical probe commission led by Gauri Bahadur Karki and taking action against the culprits, revoking the ban on staging protests at Maitighar and formulation of law to discourage threats against doctors and health workers. On the 14th day of his hunger strike Friday, Dr KC’s condition is feeble and deteriorating critically every day. Dr KC is reported to be willing to end his life in Jumla if his demands are not met. Addressing a function in Kathmandu on Friday, Minister Pokharel announced that Dr KC would be airlifted to Kathmandu for treatment. “We are preparing to airlift Dr KC any time,” said Pokharel. However, supporters of Dr KC and local people in Jumla are preparing to foil the government’s plans to weaken his strike by airlifting him away, said his supporters, who have reached Jumla from Kathmandu and other cities. “Dr KC is not ready to go back to Kathmandu,” said Dr Jivan Kshetry, who left Jumla on Friday. “His supporters and locals are ready to foil the government’s plans,” he added. Meanwhile, the doctors and health workers have continued protesting across the country in support of Dr KC. Resident doctors of Tribhuvan University Teaching Hospital (TUTH) in Kathmandu boycotted all services in the hospital apart from emergency. The doctors came to Maitighar, where the government has prohibited protest activities, and started attending to patients in the open space there. Various professional organizations have appealed to the government on Friday also to immediately address the demands raised by Dr KC. The organizations are Solidarity for Dr GKC Alliance, Save Ganga Maya Campaign, Nepal Medical Association, Nepal Bar Association, Nepal Professors Union, Nepal Engineers Association, Ayurvedic Association of Nepal, Doctors Society of Nepal, Nepal Nursing Union, Public Defense Alliance, Health Professional Organization, Kathmandu University Teachers Association, and Government Doctors Association, among others.